:: Sponsored by: Good Purpose Gallery, AS220, Brookline Arts Center, Newton Open Studios, Brookline Open Studios, Fruitlands Museum, Solomon's Collection and Fine Rugs, Vizivel, Artrageous!32, New Britain Museum of American Art, Bromfield Gallery, and the Artscope Tablet Edition. This week we're presenting Fuller Craft Museum, Gurari Collections, and the Providence Art Club with exhibitions of works that examine the world around us, offering new ways of looking at the things we sometimes take for granted. There are other interesting and exciting events for those who want more. Artscope is sponsoring Artrageous!32, Monsterrat College of Art's annual auction fundraiser taking place on Saturday April 7 from 6:00pm - 10:00pm. Tickets are on sale now. We are also sponsoring CraftBoston Spring, happening April 20 - 22 at The Cyclorama at Boston's Center for the Arts. For more information and to buy tickets, please visit the Society of Arts + Crafts's website. The May/June issue of Artscope will be at Art Basel Switzerland 2018, which is taking place June 14-17. If you would like to advertise in the May/June issue, please contact us at advertise@artscopemagazine.com or call (617) 639-5771. The deadline to submit an ad is April 15. Having trouble getting your hands on the most recent issue because of copies flying off the shelves? Artscope is now available worldwide in Newsstand for iOS! To find and purchase your own Artscope interactive digital edition, just search "Artscope" in the App Store. Once downloaded, our available issues will show up in your Newsstand. You can purchase new issues as soon as they hit the press or set up a year subscription to guarantee instant access. Plus, remember to download the free Artscope mobile app. It is available for iPhone, iPad, DROID & Tablet, and can be downloaded here or in the App store or Google Play. The Artscope app will give you important news, gallery & sponsor listings, live feed of zine posts, current issue excerpts and interactions that make you an integral part of the Artscope universe. The Fuller Craft Museum, New England's home for contemporary craft, has a schedule packed with interesting exhibitions for 2018. On view through May 13 is "Brother Thomas: Seeking the Sublime." The exhibition features and celebrates the art of Brother Thomas Bezanson, a Benedictine monk, who is widely known for his masterful work in porcelain pottery and creating original and complex glazes. The exhibition has a selection of works by Bezanson, as well as materials documenting his life. Showing through May 20, "Revolution in the Making: The Pussyhat Project" is about Pussyhats, which are pink, cat-eared knitted caps which were worn by protestors after the 2016 presidential election. The hats symbolize support for equality and resistance to the new administration's policies, and "Revolution in the Making" showcases not only the hats themselves, but the stories that surround them. "Tricks of the Trade: Illusions in Craft-Based Media," showing until November 18, is composed of trompe l'oeil, French for "fools the eye," work. The pieces shown are technically impressive and incredibly realistic, yet each contains its own unique narrative. "Object Lessons: Selections from Fuller Craft Museum's Permanent Collection" is ongoing through November 8, 2020. While highly varied, the works in this exhibit all explore the relationship between the artist, the materials they use, and the objects they create in a cultural context. In addition, the "2018 Biennial Members Exhibition" is coming soon. Taking place April 14 to October 7, the exhibition is an opportunity for new and established artists alike to showcase their work. The 2018 Spring Exhibition Reception, celebrating "Tricks of the Trade," "2018 Biennial Members Exhibition," and "Playtime in the Making" will be on Sunday, May 20 2:00pm - 5:00pm. Fuller Craft Museum is located at 455 Oak Street in Brockton, Massachusetts and is open Tuesday - Sunday 10:00am - 5:00pm and Thursday 10:00am - 9:00pm. For more information, please visit fullercraft.org. Sponsored by: Good Purpose Gallery, AS220, Brookline Arts Center, Newton Open Studios, Brookline Open Studios, Fruitlands Museum, Solomon's Collection and Fine Rugs, Vizivel, Artrageous!32, New Britain Museum of American Art, Bromfield Gallery, and the Artscope Tablet Edition. Featuring the very talented artwork by high school students from across the Berkshires as well as CIP students (College Internship Program) from the different branches across the US. In support of Autism Awareness Month, we're also featuring photographs by CIP's founder Dr. Michael McManmon, who was diagnosed with Asperger's Syndrome, throughout the Starving Artist Cafe. MAIN GALLERY @115 Empire St.
PROJECT SPACE @95 Mathewson St.
ABORN GALLERY @95 Empire St. 2nd Fl. The Brookline Arts Center is seeking proposals for an eight-week artist residency in our historic firehouse turned art center in Brookline, MA. One dynamic solo artist or small collaborative group will have the opportunity to experiment and grow their body of work with the support of the BAC. Artist(s) selected will design, create and exhibit an installation or series of work in our unique gallery space. The residency will provide five weeks of artistic development and culminate with a three-week public exhibition. Deadline: April 13. 160 artists : April 7 & 8 2018 : Free. One of the largest and longest running annual open studio events in the region. Painting, sculpture, jewelry, textiles, ceramics...Download a guide at NewtonOpenStudios.org. Since 1986, Brookline Open Studios has been an annual springtime event, held in locations all over Brookline. This event encourages interaction and creative exchange between artists and offers the community opportunities to experience a range of vibrant and creative works of art. A Preview Show is now on view at the Brookline Main Library - closing public reception on Sunday, April 22 from 1:30pm - 3:30pm. Gold and pink deco gown, detail, ca. 1930, silk brocade, rhinestones, metallic thread, Part of the Collection of The Stevens-Coolidge Place. Using collections from Trustees historic houses as a guide, leisure pursuits from 1840 to 1940 are considered through fashion, accessories, and vintage photographs. From exquisite Parisian couture to bathing suits to breezy linen dresses, the way people dressed and their accessories enhanced Americans' ability to enjoy the outdoors. Also on view at Fruitlands Museum this Spring: Inhabiting Folk Portraits with Candice Smith Corby, and Eden 2.0: Alexi Antoniadis, and A New View: Landscapes from the Permanent Collection. Both Leisure Pursuits and Inhabiting Folk Portraits are part of the Mass Fashion consortium. Mitsushige Nishiwaki, Metro, 34" x 30 1/4"
"METROPOLITAN TWIST" will be on view at Gurari Collections from April 6 - May 27. "METROPOLITAN TWIST" is a solo exhibition featuring the etchings of Japanese artist Mitsushige Nishiwaki, a self-taught artist whose works have been shown in Japan, France, England, and the United States. His art is inspired by the busy streets of Paris, New York and London and depicts the common motions of everyday life. The scenes he transcribes into art are universally familiar and yet uniquely whimsical and imaginative. Nishiwaki sometimes plays with scale to create juxtaposition and enhance the narrative impact of his works, offering the viewer a sense of amusement and joy. In "METROPLOITAN TWIST," Nishiwaki takes the mundane and familiar cityscape and gives it new life and whimsy. There will be an opening reception for "METROPOLITAN TWIST" on Friday, April 6 6:00pm - 9:00pm. 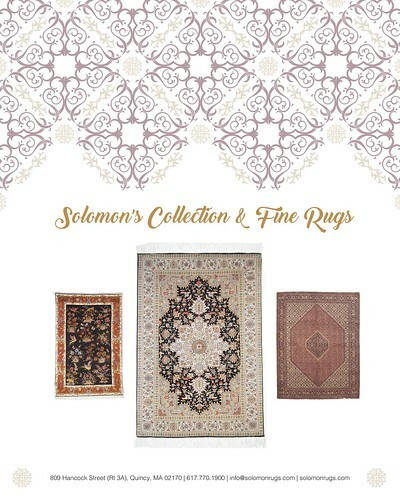 Gurari Collections is located at 460B Harrison Avenue in Boston, Massachusetts and is open Tuesday - Saturday 11:00am - 6:00pm and Sunday 12:00pm - 4:00pm. For more information, please visit gurari.com/mitsushige-nishiwaki. Bill Lane, Benefit with Friends, watercolor, 14" x 14"
The Providence Art Club is currently showing "Four Flavors" at the Maxwell Mays and Mary Castelnovo Galleries and "Near and Far" at the Dodge House Gallery through April 20. "Four Flavors" features the work of four artists: Karen Murtha, Nickerson Miles, and Susan Klas Wright in the Maxwell Mays Gallery and Bill Lane in the Mary Castevnovo Gallery. Karen Murtha paints in atmospheric oils and watercolors, and particularly enjoys depicting the human figure. Nickerson Miles is a photographer who shows the viewer what he sees through his well-composed yet candid photographs of people and nature. Susan Klas Wright is a painter of vibrant landscapes, inviting seascapes and beautiful portraits in water color and oils. Bill Lane paints watercolors depicting lively yet calm scenes from the streets of New England, mainly Boston and Rhode Island. "Near and Far" is a co- exhibit by artists Charlotte Breed Handy and Joan McConaghy. The show will include watercolors and oil paintings of local landscapes by Handy, and works of oil paintings by McConaghy, portraying her travels through Ireland. "Four Flavors" and "Near and Far" offer a wide selection of fine art that is sure to stir any viewer. There will be a reception for the exhibits on Sunday, April 8 2:00pm - 4:00pm. The Providence Art Club is located at 11 Thomas Street in Providence, Rhode Island and is open Monday - Friday 12:00pm - 4:00pm and Saturday - Sunday 2:00pm - 4:00pm. For more information, please visit providenceartclub.org/event/opening-receptions. Montserrat College of Art's annual gala art event - Artrageous!32, will be Saturday, April 7, 6:00pm at North Shore Music Theatre, Dunham Road, Beverly. Bid on works by students, faculty, alumni, staff and emerging and established artists from the region and beyond. Proceeds benefit student scholarships. Get tickets and view art at montserrat.edu/auction. American Post-Impressionists: Maurice & Charles Prendergast. Travel in time to the early 20th century when Maurice and Charles Prendergast revolutionized American art. Inspired by European artistic styles, the brothers challenged traditional artistic conventions, propelling the American Post-Impressionist movement and contributing to the evolution of American Modernism. Through June 10, learn more at nbmaa.org. From April 4 - 29, Bromfield Gallery presents "Halation" by Yang Wan, paintings that explore the ambiguity of time and dimension in nature's whispers, and "Specific Gravity" by Daniel Feldman, large digital works that create a sublime sense of unfolding possibilities. The opening reception is Friday, April 6, from 6:00pm - 8:30pm. Bromfield Gallery 450 Harrison Ave., Boston, MA Wed-Sun, 12-5 (617) 451-3605 info@bromfieldgallery.com bromfieldgallery.com. 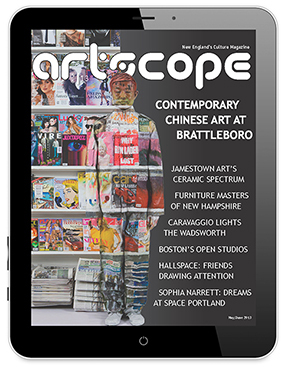 With Artscope on your iPad or iPhone, current art news and coverage is available anywhere, anytime, right at your fingertips.